This bill is provisionally dead due to a failed vote for cloture on January 20, 2016. Cloture is required to move past a Senate filibuster or the threat of a filibuster and takes a 3/5ths vote. In practice, most bills must pass cloture to move forward in the Senate. Weak gun laws at the federal and state levels leave far too many women facing a fatal end to domestic abuse. Violence against women looks very different than violence against men. Whether in the context of sexual assault on college campuses or in the military, violence by an intimate partner, or other types of violent victimization, women’s experiences of violence in this country are unique from those of men. One key difference in the violence committed against women in the United States is who commits it: Women are much more likely to be victimized by people they know, while men are more likely to be victims of violent crime at the hands of strangers. Between 2003 and 2012, 65 percent of female violent crime victims were targeted by someone they knew; only 34 percent of male violent crime victims knew their attackers. Intimate partners make up the majority of known assailants: During the same time period, 34 percent of all women murdered were killed by a male intimate partner, compared to the only 2.5 percent of male murder victims killed by a female intimate partner. Bar all convicted abusers, stalkers, and people subject to related restraining orders from possessing guns. Ensure that abusers surrender any firearms they own once they become prohibited. Some states have already adopted some of these policies, and in the past 12 months, there has been a growing movement across the country to enact laws closing some gaps related to domestic abusers’ gun access in several states, including Wisconsin, Washington, Louisiana, New Hampshire, and Minnesota. In 15 states, more than 40 percent of all homicides of women in each state involved intimate partner violence. In 36 states, more than 50 percent of intimate partner-related homicides of women in each state involved a gun. A review of conviction records in 20 states showed that there are at least 11,986 individuals across the country who have been convicted of misdemeanor-level stalking but are still permitted to possess guns under federal law. It is likely that there are tens of thousands of additional convicted stalkers who are able to buy guns. While submission of records regarding convicted misdemeanant domestic abusers to the FBI’s NICS Index has increased 132 percent over the past five-and-a-half years, only three states appear to be submitting reasonably complete records—Connecticut, New Hampshire, and New Mexico. Records from these three states account for 79 percent of the total records submitted to the FBI. Every day in the United States, five women are murdered with guns. 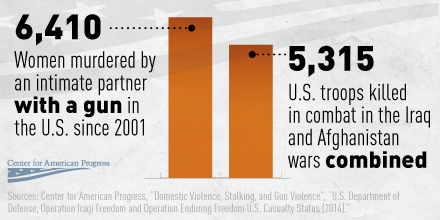 Many of these fatal shootings occur in the context of a domestic or intimate partner relationship. However, women are not the only victims. Shooters have often made children, police officers, and their broader communities additional targets of what begins as an intimate partner shooting. In fact, one study found that more than half of the mass shootings in recent years have started with or involved the shooting of an intimate partner or a family member. Enacting a comprehensive set of laws and enforcement strategies to disarm domestic abusers and stalkers will reduce the number of women who are murdered by abusers with guns—and it will make all Americans safer. Arkadi Gerney is a Senior Fellow at the Center for American Progress. Chelsea Parsons is Director of Crime and Firearms Policy at the Center. Attorney General Eric Holder and HHS Secretary Kathleen Sebelius today released the annual Health Care Fraud and Abuse Control (HCFAC) Program report showing that for every dollar spent on health care-related fraud and abuse investigations through this and other programs in the last three years, the government recovered $8.10. This is the highest three-year average return on investment in the 17-year history of the HCFAC Program. 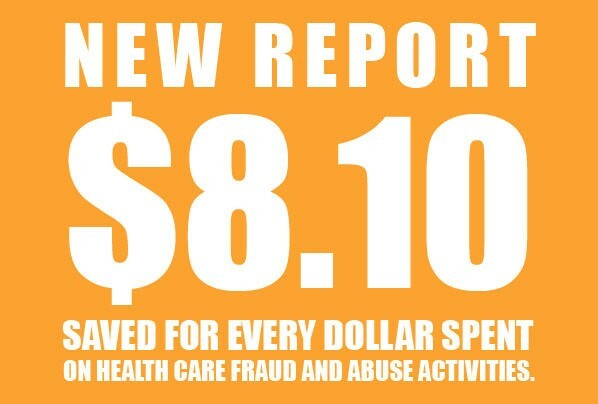 The government’s health care fraud prevention and enforcement efforts recovered a record-breaking $4.3 billion in taxpayer dollars in Fiscal Year (FY) 2013, up from $4.2 billion in FY 2012, from individuals and companies who attempted to defraud federal health programs serving seniors or who sought payments from taxpayers to which they were not entitled. Over the last five years, the administration’s enforcement efforts have recovered $19.2 billion, up from $9.4 billion over the prior five-year period. Since the inception of the program in1997, the HCFAC Program has returned more than $25.9 billion to the Medicare Trust Funds and treasury. These recoveries, released today in the annual HCFAC Program report, demonstrate President Obama’s commitment to making the elimination of fraud, waste and abuse, particularly in health care, a top priority for the administration. This is the fifth consecutive year that the program has increased recoveries over the past year, climbing from $2 billion in FY 2008 to over $4 billion every year since FY 2011. The success of this joint Department of Justice and HHS effort was made possible in part by the Health Care Fraud Prevention and Enforcement Action Team (HEAT), created in 2009 to prevent fraud, waste and abuse in Medicare and Medicaid and to crack down on individuals and entities that are abusing the system and costing American taxpayers billions of dollars. The new authorities under the Affordable Care Act granted to HHS and the Centers for Medicare & Medicaid Services (CMS) were instrumental in clamping down on fraudulent activity in health care. In FY 2013, CMS announced the first use of its temporary moratoria authority granted by the Affordable Care Act. The action stopped enrollment of new home health or ambulance enrollments in three fraud hot spots around the country, allowing CMS and its law enforcement partners to remove bad actors from the program while blocking provider entry or re-entry into these already over-supplied markets. The Justice Department and HHS have improved their coordination through HEAT and are currently operating Medicare Fraud Strike Force teams in nine areas across the country. The strike force teams use advanced data analysis techniques to identify high-billing levels in health care fraud hot spots so that interagency teams can target emerging or migrating schemes as well as chronic fraud by criminals masquerading as health care providers or suppliers. The Justice Department’s enforcement of the civil False Claims Act and the Federal Food, Drug and Cosmetic Act has produced similar record-breaking results. These combined efforts coordinated under HEAT have expanded local partnerships and helped educate Medicare beneficiaries about how to protect themselves against fraud. In FY 2013, the Justice Department opened 1,013 new criminal health care fraud investigations involving 1,910 potential defendants, and a total of 718 defendants were convicted of health care fraud-related crimes during the year. The department also opened 1,083 new civil health care fraud investigations. In March 2011, CMS began an ambitious project to revalidate all 1.5 million Medicare enrolled providers and suppliers under the Affordable Care Act screening requirements. As of September 2013, more than 535,000 providers were subject to the new screening requirements and over 225,000 lost the ability to bill Medicare due to the Affordable Care Act requirements and other proactive initiatives. Since the Affordable Care Act, CMS has also revoked 14,663 providers and suppliers’ ability to bill the Medicare program. These providers were removed from the program because they had felony convictions, were not operational at the address CMS had on file, or were not in compliance with CMS rules. From May 2013 through August 2013, CMS led an outreach and education campaign targeted to specific communities where Medicare fraud is more prevalent. This multimedia campaign included national television, radio, and print outreach and resulted in an increased awareness of how to detect and report Medicare fraud. For more information on the joint DOJ-HHS Strike Force activities, visit: www.StopMedicareFraud.gov/.